TDmonthly Magazine's Girls’ Roundtable recently reviewed three TC Pets: the Media Chest Bear, Accessory Chest Dog and Treasure Chest Monkey. The line of plush animals with hidden compartments was revamped based on suggestions from a previous roundtable review. The new toys were presented to several original reviewers plus a few new reviewers. The result? A win-win situation, for both the company and the kids, who loved the toys' cuter look and the addition of more secret spaces. What It Is: Each Treasure Chest Pet is a plush animal designed with an oversized head and a hidden compartment for storing treasures. The head detaches to serve as a pillow. Other offerings include a Media Chest Pet and an Accessory Chest Pet. 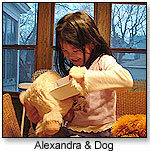 What the Parents Thought: "I like the hidden compartments in a stuffed animal," said Pauley, calling them "easy to use." She found the hangtag helpful in revealing some of the compartments. Wilson's favorite feature was the toy’s double function: "Any item that serves [a] dual purpose is a good value to me — especially if one function is storage!” Tong agreed, "It’s not just a toy; it’s got functionality, too!" Pauley liked the designs of the animals, particularly the monkey, noting “great detail on the face.” Summers said, "The fabrication is solid, the design of the animals is commendable, and the fabric is soft and appealing for adults and children alike." Wilson agreed, saying, "All three [TC Pets] are fluffy and cute." Zuidema appreciated "the softness and the much improved appearance of the pets." What the Kids Thought: "Alyssa (9) liked the cuddle factor best," observed Zuidema. "She also thought the faces were much cuter than the previous incarnation and the size of the body was made more proportional.” Elise (10), who enjoyed using the magnets on the heads to hang the pillows on her iron headboard, "uses the Accessory Chest Pet to store jewelry," and brother Steven (8) noted that these pets appeal to boys, too. He likes them "for the same reasons Elise (10) likes them," he told his mom. Alyssa (9) was attracted to the internal compartments much more than to the external storage. Lucy (5) liked that she "can hide her special treasures away," said Pauley. "She loved the dog immediately . . . because it has a drawer and it is golden." She especially enjoyed the hidden pocket in the monkey's head, which "she had to really look for." Alyssa (10) and Alexandra (6) told their mom, “I can find them all, Mommy … look at what this one is for.” Tong said they did not initially discover the two pockets in the ears of the dog, "but, boy, were they excited about that secret space!" Abbey (4) and Laura (3) "abandoned the secret spaces and used the soft detachable heads as pillows," observed Summers. They enjoyed the soft, plush feel of the TC Pets, and "placed their Little People inside the drawers and used it briefly in imaginative play.” Tong reported, "The kids actually enjoyed the pets and they thought they were very lovable." What the Kids Learned from this Toy: Alyssa (9) learned the value of her own feedback, specifically that "constructive criticism can encourage a company/person to take a look at their work, rethink their ideas and make improvements," Zuidema reported. How to Improve It: Four of the moms found the price point a bit high. Pauley noted that the sides of the drawers curved in somewhat, making the drawer difficult to slide in and out. She also found that the flap to cover the CD compartment on the bear would not stay shut, even without CDs inside. She thought the Media Chest Pet might appeal to kids older than Lucy, who at age 5 "does not really have her own media yet." Since the storage compartments are relatively small, Summers suggested adding a strap so the TC Pets can become purses. She called the magnetic connection for the head/body "tenuous at best," although Wilson thought it better than Velcro, which becomes fuzzy with use. [Editor’s Note: Velcro was used in the previous version of TC Pets.] Wilson was concerned, though, that the magnet could harm electronic devices such as MP3 players, and recommended either a warning to this effect, or "a comment stating that [the] magnet is not strong enough to interfere with such devices." Summers suggested that if the Media Chest Pet can store CDs, why not expand one compartment to hold a small CD player? Comments on Improvements to Previous Versions: Zuidema noticed the new tag shows more "warmth" and does not depict a headless pet, as the former tag did. "The heads attach to the body better (the strong, hidden magnet is a super solution), the hiding places are more plentiful and the appearance is more enticing," she added. Tong noticed, "The head of the bear seems to stay on much better than [on] the earlier version ... we tested." Would You Want Another Toy Like This? "These fluffy, attractive toys make a nice accent to any child’s bedroom or playroom, with the bonus of being very nice storage receptacles for small items," summed up Wilson. Alyssa (10) and Alexandra (6) "love the idea of having a 'pet,' and then being able to have secret places is also a winner." Participants were Penelope Pauley with Lucy (5); stay-at-home mom Crystal Summers with Abbey (4) and Laura (3); stay-at-home mom Mildred Tong with Alyssa (10) and Alexandra (6); Teresa Wilson, editor of “HOMES Newsletter,” with Elise (10); and homeschool mom Jill Zuidema with Alyssa (9).